A couple weeks ago my little brother and his girlfriend drove in to spend a day in Pittsburgh. When I first found out they would be coming, my immediate concern was where to take them for dinner. After all, the two of them are like me in that they like to explore and appreciate good food, so I knew I would have to come up with something that makes Pittsburgh dining shine in their eyes. I struggled with this a bit as there are several fine options in and around town, but Salt of the Earth was a frontrunner from the beginning and emerged a winner in the end. Besides, I had been itching to go back to Salt of the Earth since my first visit there back in the summer! Traffic was awful on this snowy day - the snowiest yet this winter - but even though we made it to Salt much later than we had planned, it was fairly empty, which was great for us as we didn't have to wait for a seat. The restaurant actually filled up shortly thereafter, however, and the fact that so many people came out to dine at Salt despite the weather reflects very highly on not only the restaurant but the Pittsburgh dining scene in general. Salt changes its menu seasonally, and preparations within the same menu can vary from day to day. One of the current entree features is Duck, which grabbed my attention the most. 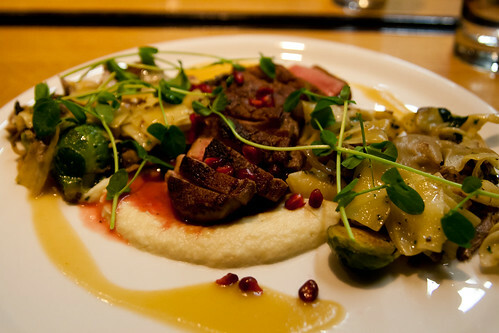 The tender, juicy duck meat was served with parsnip puree, haluski (a Polish noodle), and Brussels sprouts, topped with pomegranate and a side of apple butter. It was absolutely amazing; everything was done just perfectly! Even though I ate every single last bite of the duck entree, I couldn't resist dessert (as is typical of me!). 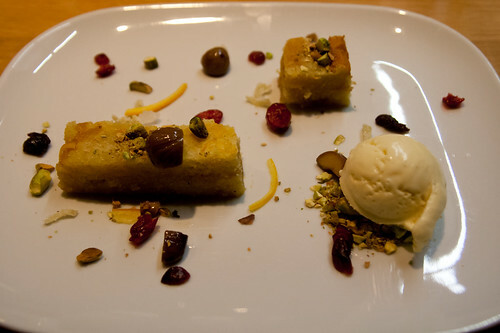 I decided on the Fruitcake, which consisted of two small bites of cake made with some combination of amaretto, chestnut, pistachio, and orange, and a scooplet of eggnog ice cream. Amazing. Lil' Bro's girlfriend also had the duck entree and loved it. Lil' Bro went with the scallops. He thought the sides were all right, but really liked the main feature of scallops and mussels. All in all, they enjoyed Salt of the Earth quite a bit, and surprised me by treating me. Thanks, guys! It was so nice to spend time with you two!